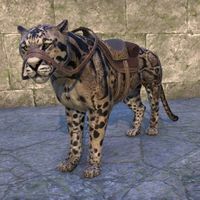 The Chilling Senche-Lizard is available from the Xanmeer Crown Crates as a Radiant Apex-level reward.. Its default name is "Frost-on-Scales". This appears to be a reanimated undead corpse of a wolf mount that was burned to death in some horrific event, and has returned hell-bent on vengeance. An intimidating ride, for sure! 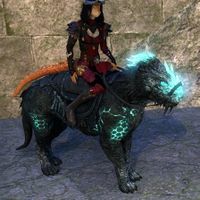 The Cinder Wolf is a fiery skeletal wolf available in the Reaper's Harvest Crown Crates as a hidden Apex-level reward. Its default name is "Old Char". 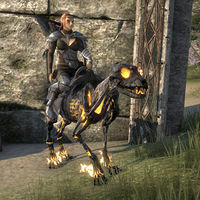 After years of conjuring, Peregrine Direnni sought a new Daedra to compel to be her mount. She took an immediate liking to the Cold-Flame Atronach, found in the Daedric realm of Takubar. Summoning it in the form of a wolf just added extra flair. The Cold-Flame Atronach Wolf is a blue Flame Atronach wolf available in the Flame Atronach Crown Crates as a Radiant Apex-level reward. Its default name is "Blueflame". This page was last modified on 4 February 2019, at 09:18.